Although fruit is a healthy food, not all fruits are good to eat when you are on a diet. There are some fruits that contain glucose and high calories so your dream of getting a slim and slim body can fail if you eat too many of these fruits. The fruit does have a sweet and fresh taste that makes it much liked. Fruit such as mangoes, bananas, melons, dates, and pineapple are very sweet examples of fruit. But this also means that these fruits also have high sugar levels. A single Avocado contains calories of 322 calories. This is even more of a cheeseburger that contains 313 calories. 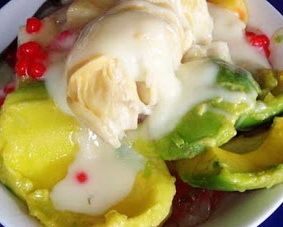 Although it is the fat in the avocado is unsaturated fats, but still it will affect dietmu. The durian is the fruit contain lots of carbohydrates, fats and proteins. Durian fruit in 1 it contained 881 calories, this is equivalent to a serving of a meal a day. If you eat 1 piece only, moreover eat more than 2 durian fruit, it will be very influential to the ideal body. If you are observant, usually in a match played at half the sports athletes are often seen eating a banana. In fact one banana fruit can provide enough energy to do heavy activity during 45 minutes. But, in one banana fruit also contains approximately 100 calories. The fruit of this one is like a double-edged sword for those of you who are running diet. If consumed in appropriate portions, dates proved to be free of cholesterol and fat as well as being able to decipher fat. But if excessive portions, then the diet you will fail because of the sugar content of date is quite high. Those are some fruits that should be avoided if you are on a diet. Basically eating fruit while on a diet is indeed good, but you must be careful in choosing fruit. If it's wrong, it's not successful, but it can fail completely. If indeed you still want to eat the fruits mentioned above, this might be balanced with other fruits that have lower calories and sugar levels.